2016: Ed Adams (42) has lived in his money-pit Victorian home all his life in the small market town of Anderbury, England. Ed teaches at the Anderbury Academy, the same school he attended as a boy. He's single, doesn't have any children, and likes to drink. He recently has taken in a lodger, young Chloe (late 20s), but, other than that, his life remains static. Ed still sees friends from boyhood, Gavin ("Fat Gav") and David ("Hoppo") Hopkins. They were inseparable when they were kids, "meeting up most Saturdays." The group included Fat Gav's best friend "Metal Mickey" Cooper and a single girl, Nicky. (Ed was known as "Eddie Munster.") They liked going into the woods, riding their bicycles or meeting up at an old playground. Each one is slightly different from other children in town. Fat Gav's parents own The Bull, a local pub, and live in a new housing development. They're nouveau riche and garish. Hoppo's mother is single and a cleaner (his father left when he was a baby). Mickey has a brutish older brother Sean. Nicky is being raised by her single father, the local vicar Reverend Martin. And Ed's mother works as a doctor, and is bigger breadwinner than his father, a freelance writer for magazines and newspapers. The kids are all a bit odd. "Thinking back, I guess one of the reasons our gang all hung out together was that none of our families was exactly 'normal.'" During their six-week summer school holiday in the summer of 1986, the children are twelve and loving their time off. A new, odd-looking teacher has moved to town. In July a fair comes to the village. Fat Gav's parents throw him a big barbecue in August to celebrate his twelfth birthday. While in the woods building a den, the group is attacked by others. There are other, grown-up matters, some very ugly and dark, as well as menacing events happening in Anderbury that summer. The adult Ed spends much of the novel trying to recall and make sense of details from the past in order to prevent yet more threats in the present--and to solve a murder. 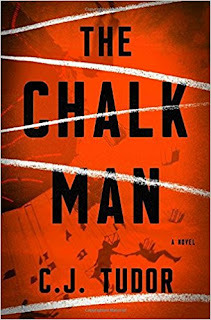 The Chalk Man clearly draws inspiration from Stephen King's work, such as the novella The Body (the basis for the film Stand By Me) and Heavenly Shades of Night Are Falling (the basis for the film Hearts in Atlantis), Stephen Spielberg films like E.T. the Extra-Terrestrial and Super 8), and from the television show Stranger Things (which is, itself, inspired by King and Spielberg and the 1980's). The novel explores the scary parts of childhood, and how children experience of the world uniquely. Children see and hear things they "shouldn't," and they recognize older people for who and what they are--even if other adults don't listen or believe them. Kids also have a lot of anxiety for they know if there are problems at home, that they have to deal with bullies, and that they face-to-face with actual evil, no matter how much parents attempt to keep them safe. While this novel certainly pays homage to the two great Stephen's, C.J. Tudor's debut is its own phenomenon. Her first-person narrator, Ed Adams, is quite the philosopher, both as a child and as an adult. He allows the reader to reflect on how our childhood may define the rest of our lives. He's as unreliable as the other characters, so there is no one whom we truly can trust to be telling the true version. The plot has hair-pin turns, both in the past and the present, and the reader has barely recovered when something new is revealed. Tudor is a highly skilled storyteller, and her plot, narrative, pacing and characters are carefully, perfectly constructed. 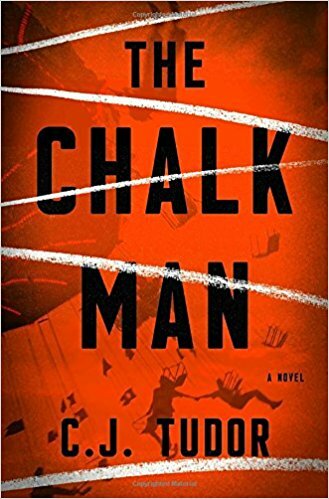 The Chalk Man offers readers the chance to go on a terrifying thriller ride. This reviewer is not going to give away any spoilers, only advice: take the ride! Thank you to the publisher for allowing me to read a digital version of this novel through NetGalley.